Wednesdays… What can you do with your Wednesday evenings? We have been doing some thinking here at Church End and have decided that we just don’t give you guys enough time in our beautiful Tap Room, because of this as of April 19th we will be opening EVERY WEDNESDAY 6pm until 11pm! Not only this but we will be having monthly quiz nights on the 1st Wednesday of every month (first one May 3rd) and monthly open mic nights on the 3rd Wednesday of every month, the first one of these will be on our official Wednesday opening day 19th April! Check out the individual events pages for open mic nights and quiz nights for more info or to book in! What an incredible weekend we had once again for our Cider Festival and Motorbike Show. On Saturday afternoon around 50 bikes turned out of all ages, makes and models for our annual motorbike show, sponsored by Huggys Speedshop. The event as a whole was a massive success, many a bike was seen, many a song was listened (and danced to), many a laugh was enjoyed and a few too many ciders were drunk! The best art about the weekend was seeing smiling faces and people enjoying themselves, from regulars to newbies everyone seemed to have a fantastic weekend! Here is my massive list of thank yous! I can’t thank everyone enough for their help and support over the weekend, firstly all the customers, if you lot didn’t turn up and enjoy yourselves we wouldn’t have an event and I wouldn’t have a job! So thank you all for coming along. Also a massive thank you to all of the following! To Rowleys Butchers in Arley for supplying all of the meat for the barbecue as well as our sausage rolls and pork pies. To the Heritage Cake Company for supplying everyone with delicious cakes all weekend. To Huggys Speedshop for sponsoring, judging and supplying the prizes for our motorbike show. To Sick Squid Printing company for bringing all of their hand printed clothing range and accessories to the motorbike fest. To each and every one of the artists and bands that played over the weekend, who were all fantastic and well praised by their respective audiences. And finally, a massive thank you to each and every one of my staff and friends that worked, helped, supported me, and the event as a whole, throughout the weekend. 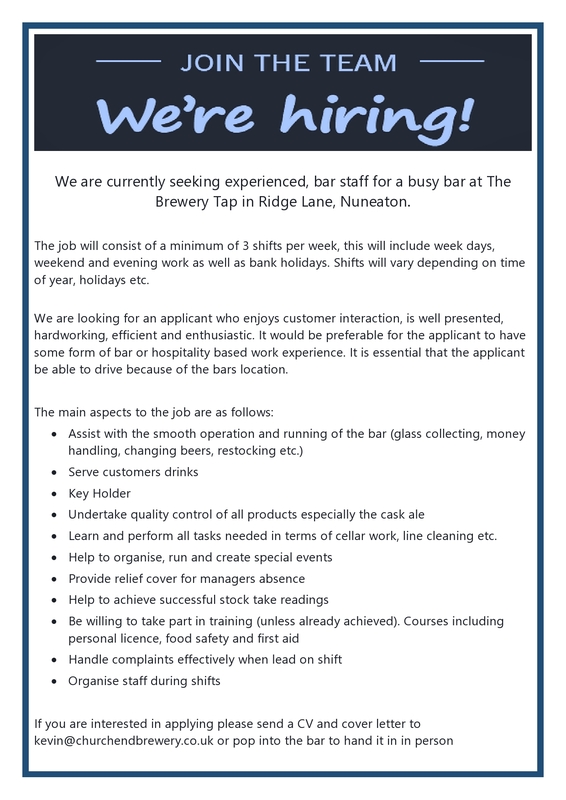 I have to add that I include all the brewery lads in this as well, they do a lot more for us than just the brewing of the beer! Everyone worked incredibly hard to make it a success and you all deserve a massive pat on the back! Roll on the car show! Summer is nearly here, the chickens are laying regularly, and happy with the warmer weather. If Katie is about, ask her for an egg for your child! Come and see our lovely refurbished benches, done by a local friend ,Peter, and admire Katie's pots and Spring flowers. All walkers (and their dogs) are welcome. If there is a group of you, please ring ahead to book, and we can have your meal prepared for you. We have had a Christening party here recently which was lovely, hopefully we can support the village needs and requests. Copyright © 2019 Church End Brewery. All Rights Reserved.